The new technique, known as ‘small-scale DAB’, allows local and community stations to hit the airwaves using freely-available software and equipment costing from £9,000. Previously, these stations have broadcast on analogue AM and FM, but have been held back by the higher cost of broadcasting on the UK’s Digital Audio Broadcasting (DAB) radio platform. Ofcom has been testing small-scale DAB since June 2015, with 70 local stations broadcasting on trial licences around the UK. Today, we have published a report for the Department of Culture, Media and Sport, who made funding available for the project, that confirms the trials have been a success. Small-scale DAB in the UK was pioneered by an Ofcom engineer, Rashid Mustapha, who initially tested the concept by installing a digital radio transmitter on a Brighton roof-top. Ofcom engineer Rashid Mustapha was granted a test licence and installed a low power digital radio transmitter on a Brighton roof-top. Rather than buying expensive hardware normally used to broadcast digitally, Rashid used ordinary PC hardware and a Software Defined Radio unit. He did all of this in his own time, rather than as part of his responsibilities at Ofcom. The test transmission was an audio track of squawking seagulls. Following this trial, the Government asked Ofcom to develop the concept further and carry out ‘real world’ tests. Ofcom’s final report (PDF, 4.0 MB) today shows that these trials were highly successful. The technology worked well, and the stations co-ordinated effectively with the multiplex licensees. Neil Stock, Ofcom’s Director of Broadcast Licensing, said: “This technology could open up a new, local dimension in digital radio. We’re confident that a UK wide roll-out of these stations would be technically possible and commercially viable. “Our trials have enabled groups of community and local commercial radio stations to work together, enabling new stations to serve local communities right across the UK." 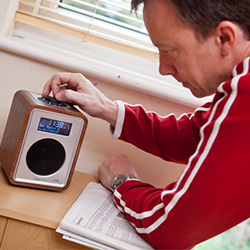 The Government will consider the findings of the report, and Ofcom is ready to work with it on any necessary steps to enable small-scale DAB stations to be licensed permanently. Overseas, stations using the technology are now on air in Switzerland and France. Other regulators in Europe have approached Ofcom to express their interest in using the same approach, which suggests that small-scale DAB could be deployed in many other countries.